The right connection can work wonders. Being connected to something great makes one great. It is the difference between an ordinary building and the Kaʿba. The same applies to people. To be a willing, dedicated, realised servant of the All-Merciful is to be someone who has achieved his true potential in this life. Who are these people? The All-Merciful Himself has described them in His book. Knowing their qualities is the first step to taking on their qualities – a means to become such people. This course is a detailed analysis of who the servant of the All-Merciful are according to sura al-Furqan. Being a servant of the All-Merciful is an honor, and it is greater than just being a worshipper. It means that the servant is accepted by the All-Merciful, and made close to Him. Consequently, this means that the servants themselves have mercy towards the creation of Allah. This manifests itself towards all of creation. Even when the uncouth deal with them they respond in ways that diffuse animosity and tension. They are characterized by their devotion to Allah, expressed through prayer and recitation of the book of Allah night after night. They have the right balance of fear and hope, and constantly beseech the All-Merciful for protection from His punishment. They ask Allah to make their children and spouses a source of joy for them by making them obedient to Allah, and aids in obeying Allah. 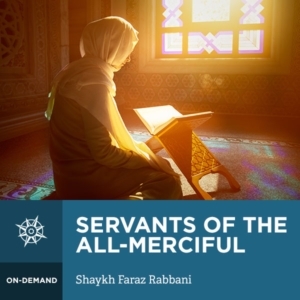 Join Shaykh Faraz Rabbani as he eloquently shares the deeper meanings of these verses, bringing their content within reach. The reasons behind the study of such verses is expounded, and the benefits are beautifully explained in this course.